Hudson Baby 2 pack Muslin Swaddle Blanket is soft and breathable to help baby sleep more peacefully. This blanket is generously sized at 46"x 46" to make swaddling easy. 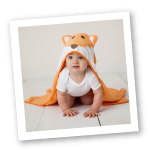 Made of 100% cotton, this blanket is safe and gentle on baby's skin, but durable and machine washable for everyday use. This two pack contains one print blanket and one solid coordinating color for a fun set. Blankets can also be used as a nursing cover, stroller cover, and for tummy time. This item arrives with a gift ribbon tied around so it is ready to give with no extra wrapping necessary! Perfect for last minute gift ideas!